The pension is a financial security that the people get after working tenure is over. They get these financial benefits in return for their services that they have rendered years ago. There were times when this pension was not enough to fulfill the daily requirements. Most of the people have to seek something else to earn once their job tenure was over. Today the pension is increased considerably to keep the ex-workers in a comfortable zone. The governments still strive hard to pay these people for what they have done for the prosperity of their hard working class. In the recent budget, the pension rate has considerably increased. The current amount that the federal pensioners are getting has been raised from Rs. 6,000 to Rs. 10,000. This monthly increase can help them uplift to some extent. This remarkable step was taken last year when the government decided that the minimum of 6,000 Rs. was not enough for many pensioners. Hence, they planned for the increase especially considering the people who were falling in the category of the low budget pensions. The details related to the pensions are easily available on the official website of the Finance Division. The regulation wing was instructed to upload the official instructions in this regard. The notice that appeared on the website stated that the increase was made after the decision was sanctioned by the President of that time. The notice was to be implemented from the first of July last year. This notification was related to the civilian federal pensioners who had served either in the civil institutions or the defense organizations. In order to make the process easier to understand a revised commute and pension sheet was introduced. This sheet was supposed to be used for the people who got retired on the first of July, 2018. The sheet is very simple. 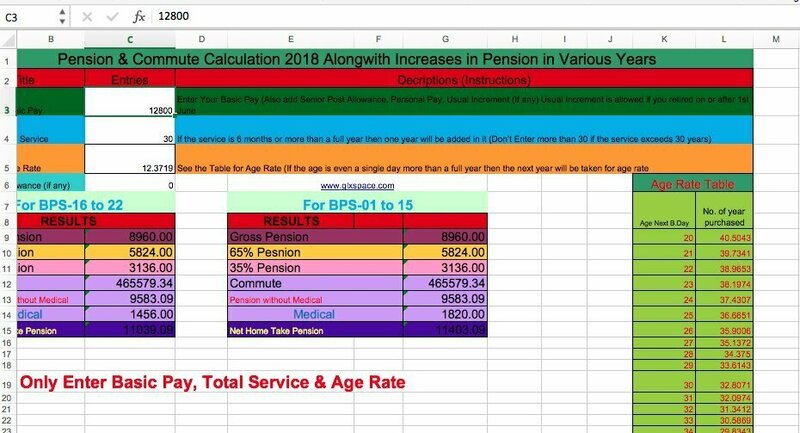 If you are aware of the basic pay, complete service tenure and above all the age, you can get ct pension calculated through the sheet. Enter the basic pay that you were last drawn also add senior post allowance, personal pay, and increment. calculate your total length of service (more than 6 months will count 1 year). Enter Ardali Allowance for the employees of BPS-20 and Above. your pension will be calculated automatically. Shoaib Akhtar Getting Married to 17 Year Old?